Some of the tastiest issues in current competition law arise in the food sector. In fact, as you’ll see in a second, some of those issues are the same ones that we often face in other dynamic two-sided markets that generally attract more public attention. At Chillin’Competition we’ve always paid our fair share of attention to food distribution and groceries (in fact our first posts on endives still ranks among out most read ever (actually, when you search for Chilling Competition on Google the word endives appears immediately in the autocomplete box, which may seem a bit odd). Today, we’re happy to include a “sponsored link” to the work done on this subject by a good friend of ours. Javier Berasategi (former lawyer at Stanbrook in Brussels, former President of the Basque Competition Authority –yes, there is one-, surfer, runner, alpinist and overall a quite unique guy now running a solo legal practice) has authored an also quite unique work on supermarket power. As always, it’s original, thought provoking and perhaps a bit controversial. “This paper analyses the sources of supermarket power vis-à-vis shoppers and independent brands. This power transforms leading supermarkets into vertically-integrated competitive bottlenecks that are able to restrict competition between brands (including their own ones) and reduce consumer welfare. However, competition enforcement has failed to address their bottleneck role and the negative consequences of their practices on dynamic competition (i.e., a market where the competitive process fosters innovation, quality and variety), the ultimate goal of competition policy. This paper proposes complementary regulatory and competition remedies to ensure that access to supermarket platforms and competition within them promotes fair dealing, consumer welfare and economic growth. It draws inspiration from the remedies enforced in other competitive bottlenecks such as CRSs, mobile communication networks, internet service providers, internet search engines and credit card networks”. [It’s interesting that the paper brings together groceries and tech stuff, particularly following Nicolas Sarkozy’s cautionary words about the perils of comparing endives to Apple (see here). Although, to be fair, Kevin Coates had done a similar link before with his “exploding banana hypothesis” (I’m saying this to force him to explain it on 21st Century Competition …)]. The report, titled Supermarket Power: Serving Consumers or Harming Competition, is available here Take a look, it’s only slightly above 350 pages. P.S. 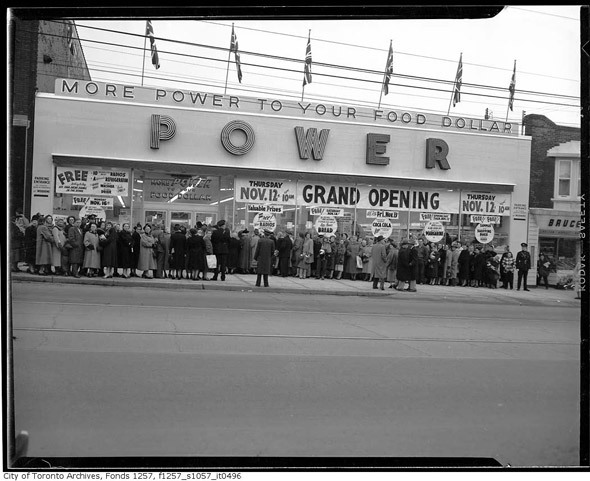 The picture may be subject to copyright, but I deserve full credit for having found an image of a supermarket actually called power. « What makes a great lawyer?